The last article about our most recent WW2 Airplane Packs series presents the Yokosuka D4Y Suisei, probably the least familiar to many people. 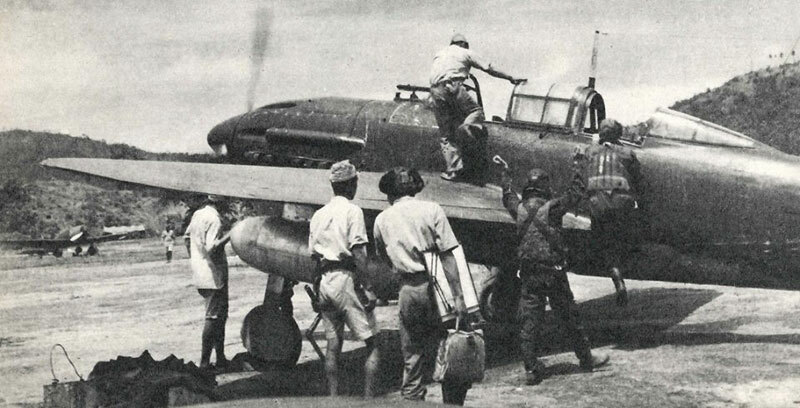 If the subject of “Japanese Dive Bomber” is mentioned, many people quickly think “Val” – the Aichi D-3, famous for its fixed landing gear (sort of the Japanese Stuka) and its impact in the early years of the war. Ask someone about the “Judy” dive bomber and they may struggle a bit. Which is too bad, for this plane had an interesting career, and final design problems kept it from being far more prominent in history, even though it has the distinction of being based on a failed German design and saw production problems using a licensed German engine. Development of the “Suisei” began in 1938, with plans for a fast, maneuverable dive bomber, capable of long ranged action. Based on the German Heinkel 118 (which lost the dive bomber competition to the Stuka in Germany) the plane centered around an Aichi, V-12 engine, a license-built copy of the German DB-601 (powering the Me/BF 109). A Yokosuka D4Y1 used as reconnaissance aircraft, in 1943. The Suisei had a sleek, slim fuselage and excellent speed—fully 100mph/160kph faster then the Val. 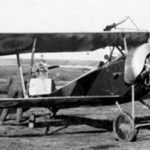 Range was extended by making the plane as light as possible, sacrificing things like self-sealing fuel tanks or any armor protection. While the plane could actually fly faster than the US Wildcat fighter (and faster than the A6M Zero), delays in production meant its first combat was facing the faster Hellcat and Corsair fighters, and a few well-placed shots could turn the Suisei into its literal namesake (“Comet”). Offering excellent speed in both level flight and diving, plus outstanding maneuverability, the Judy quickly showed significant problems with the frame “fluttering” during high stress flight - and “stress” was the norm for a dive bomber. The remarkable fact is to learn that one of the main reasons the Heinkel 118 failed to gain a contract in Germany was that the prototypes disintegrated while being tested. These problems meant the plane had to be held back before going into full production. Early production models entered service in mid-1942 in lower-stress recon roles, and in fact there were two Suisei’s present at the Battle of Midway, aboard Soryu. While the air frame problems were fixed, there were also struggles with the engine, and some argued it would be better to use a radial engine, which the Japanese had extensive experience with. The “D-4Y-33” model of the Suisei used a radial engine, which produced greater performance but reduced range. This version was used mostly by Army units. The first batch of dive-bomber Suisei was not introduced until early 1944 and was found to work well for the large “Fleet” carriers it had been designed for but not so well from the smaller, slower carriers which now made up the bulk of the IJN at that point in the war. A strengthened, catapult version took care of this problem (and also made the plane available for use with the converted battleships Ise and Hyūga). Imperial Japanese Navy's dive bomber Yokosuka D4Y, also known as "Judy". The first major action involving Suisei was the Battle of the Marianas, where the bomber’s weakness contributed to the nickname “Marianas Turkey Shoot.” One Hellcat pilot shot down 6 “Judys” in just minutes. As their fortunes continued to decline, Japan began using more and more planes in the Kamikaze roll, where the high speed of the Suisei made it very effective, sinking the USS Princeton and damaging many other ships. A purpose-built Kamikaze version carried an 800kg bomb, no tail gunner, and some even had rocket boosters for additional speed at the end of the dive. The plane’s speed and maneuverability also saw it pressed into service as a night fighter against the B-29s. Though armed with 20mm cannon in upward firing “Schräge Musik” fashion, the lack of radar and firepower meant the plane had limited effectiveness. Counting all variants, there were just over 2000 Yokosuka D4Ys built, making it the most-produced bomber for the Japanese Navy. There were Suisei units in operation to the very last days of the war, and it is remarkable how “little-known” the Judy still is today. In Wings of Glory, the Suisei is featured in three versions from different Air Groups (or “Kokutai”, a formation in the Japanese Naval Air Service which contains a mix of fighters and bombers.) Records for individual pilots in this service are very limited, so the models present color schemes from a range of different units, from one of the most famous to those who served with much less acclaim. A D4Y Suisei preparing to take off. All three models contain a Special card for Dive Bombing and another card for Drop Tanks. The first card allows the airplane to drop bombs after executing two sharp dives, one after the other, and before the firing phase. The “Drop Tanks” card is useful when using rules about fuel consumption, allowing the airplane to carry additional fuel - up to 16 points of fuel. One of the first land-based flying units in Japan (dating back to 1916), it became an air testing and evaluation center which made many recommendations about operational improvements and even changes in naval air doctrine. This elite test unit for new planes and how to use them happened to be the source suggesting that, while the D4Y worked on its structural strength to allow more effective dive bombing, it would still be useful in its current form as a fast recon plane. 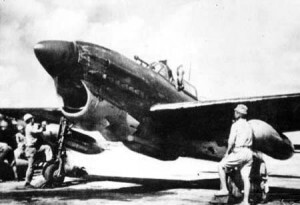 As the war progressed, replacement pilots were desperately needed, the "Yoku Ko" became more of a basic training unit than R&D, and acted as a full combat unit to help defend Iwo Jima, led by leading ace Saburo Sakai. Part of the unit also participated in the defense of Okinawa but was withdrawn to Japan in April for home defense. 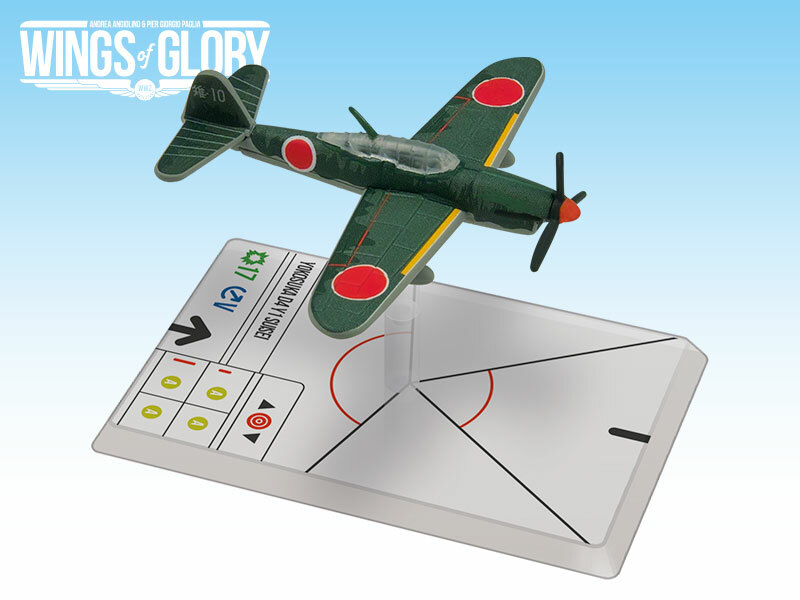 This model comes with the card “Precision Dive Bomb Aimer.” Thanks to this skill, the player can fine-tune the precision of its dive bombing at the last possible moment. 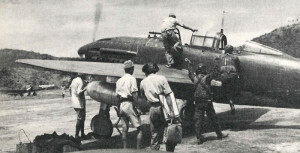 The Yokosuka D4Y1 Suisei used by Kokutai 121 featured in Wings of Glory. The K 121 group was also known as the "Green Pheasant" group. It was formed in October 1943 and took part in the Battle of the Marianas as part of the 61st Aerial Flotilla, and dissolved in 1944 after taking devastating losses at the Battle of Peleliu. This D4Y has the skill card “Good at Escaping” and can be played when using of the Tailing optional rule, determining this airplane may not ne tailed, unless the tailing airplane’s pilot is also an ace with this skill. This air group had it first major engagement at the Battle of the Philippine Sea. While that episode is best known for the devastation of the Japanese Navy and Naval Air in the "Great Marianas Turkey Shoot," Koku 601 suffered more terribly from US submarine action, as the USS Cavalla hit the fleet carrier Shokaku with three torpedoes, leading to a catastrophic explosion that killed over 1200 men, including nearly 400 from Koku 601. The unit also suffered severe casualties with the loss of the IJN carrier Taiho, also lost to a submarine (and poor damage control). Small numbers of the unit served at Iwo Jima and Okinawa, largely in a Kamikaze role, while the remnants of the unit were pulled back for the defense of Japan. This version is the D4Y3 type, using a radial engine. It includes the card “Fire Expert”, which reduces its damages when the airplane is on fire. Information sources: "Falling Comet: Yokosuka's Suisei Dive-Bomber", Huggins, Mark (Air Enthusiast, No. 97, January/February 2002); "Japanese Bombers of World War Two, Volume One", Francillon, René J., (Windsor, Berkshire, UK: Hylton Lacy Publishers Ltd., 1969); "World Encyclopedia of Military Aircraft", Angelucci, Enzo, ed. (London: Jane's, 1981); “Aichi 99 Kanbaku 'Val' Units: 1937-42”, Osamu Tagaya; “F4F Wildcat and F6F Hellcat Aces of VF-2”, T. Cleaver; “Japanese Naval Fighter Aces: 1932-45”, Ikuhiko Hata, Yashuho Izawa, Christopher Shores.